AffiliateBible.com » Dealer Dans Blog » Thank Super Bowl It’s Sunday! Seriously – isn’t today just the greatest day? It’s something you don’t get in sports like NBA or NHL or MLB unless it’s a Game 7 – today, there MUST be a winner! It’s one game, winner takes all. No picking yourself up for a game 3 with home advantage or anything like that – one team will leave as winners, and one team losers. That’s what I like about it – it’s definite. And you can go out and party it up and know there’s no such thing as an anticlimactic finish, as opposed to the NHL, where you can get together with your buddies for Game 6….only for it to have to go to a Game 7. Another reason I’m looking forward to it is I’ve been dealing with a family member who has had really bad health issues as of late. I won’t go into the details but it’s been quite the last few weeks for me. That’s why there’s been no Affiliate Bible articles – I’ve barely had time to think let alone work. I also won’t be going to LAC unfortunately due to this. So I’m really looking forward to leaving reality for a day, getting together at noon for the Habs/Jets game and basically drinking all day, and eating lots of crappy unhealthy food. I am going to eat so many chicken wings, pizza, chips and other crappy food that I’ll have to use some industrial style toilets for the next few days! I’m not sure who will win this game – but it should hopefully be a hell of a match. I’m a Patriots fan, so F both teams really! You’ve got the best offense versus the best defense – I just hope they don’t cancel each other out. I think my favourite part of the day is the prop bets. I generally try and put on 100 different prop bets throughout the game, sitting there with a big piece of paper checking it all off. Always a lot of fun win or lose. Let’s hope for a great game! You most likely saw this article – the $50 Superbowl Prop that will win $710,923, 613,350. Of course no online bookie would accept that action and the author mentions that in the article. But if I’ve learned anything it’s that no-one actually reads articles anyway! Every time I see it shared people talk about how they’re going to put on the same bet etc. Either way – this is fantastic link bait. I always do a list of the crazy superbowl prop bets on websites and get some good traffic – but linkbait wise, this is incredible. Really adds that personal touch and is a fun article to boot. Also look at the way it’s structured. Along with the content he uses big text for listing the bets, a running calculation and lots of images so that even the skimmers get the jist of it. I like when I see advertising basics from offline make their way onto the online world. Especially when they’re done in a clever way. Note the bottom – “Create An Ad Like This for Order of Books”, which is one of my websites and I have a Facebook page for it. It’s tremendous, and it’s a great way to squeeze blood out of a stone. 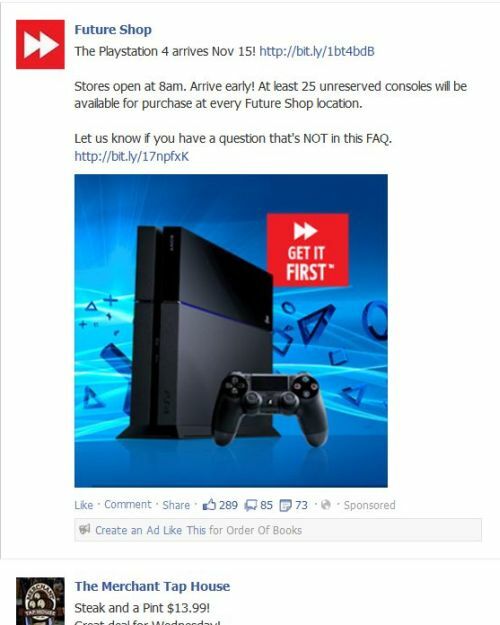 It’s not enough that they have Future Shop paying them to actually advertise that, but they’re then trying to turn around and use that ad to get even MORE money. I love that sort of thinking. Love it or hate it, Facebook never stop thinking “How can we make money?”. And they look at current revenue streams, then look at ways to make MORE money from that. So clever and slick. Just beautiful. On the other hand, you have Gmail. I can’t remember when they did it, but I think it was last year at some point – they decided to make it “easier for the user” by adding tabs to their e-mail. You would have a Primary Tab, Social Tab, and Promotions Tab. I guess like most things Google it’s a fine concept – but the execution is horrible. So many people I know (1) have zero idea how to turn this off and just assume it’s forced on them, and (2) never ever click social or promotions tabs, thus missing out on many e-mails. The impact of this can be huge. One of my mailers I send out recently started going to the Promotions tab, and this has resulted in 40% less readership. 40%! And even then, some of the readership is a good week after I actually sent out the mailer so it’s people remembering about it later on. It’s actually really smart. The ads are clearly labeled so you know they are ads – but that actually just makes them stand out more! And of course a year from now we’ll probably be seeing those ads in the main inbox, whether or not you actually have tabs. I just think it’s interesting seeing how polar opposite the ad concepts are from these two powerhouses. Facebook go with using advertisements to then try and add to the user experience, while Google go with adding to the user experience, so they can then advertise on it. It amazes me the amount of times I see a forum post where an affiliate is questioning whether their tracking works for a casino or poker room, yet actually haven’t taken the time to test out if the affiliate link is actually working or not. The majority of time – yes it will – but you should always be testing them. Not every month or anything like that. But every time you sign up with a new program, or get an exclusive affiliate link to use, or simply decide to make one room your #1 room for the month – test, test, test. And you don’t need others to do it for you! (IP Blocking aside). I’m not sure if it’s laziness or what – but it takes less than 5 minutes to sign up at a gambling site using fake data. Then simply wait a day(unless it’s real time) and see if it has showed up. And hell – doing it yourself means you KNOW you followed the steps correctly and takes that possibility of user error out of the equation. I had a good reminder of why you should do this a few days ago. For one of my sites, we decided to promote a special offering at Unibet. I was running short of time, so I went with that “trust” factor we all have, made sure the affiliate link worked(it went straight to a registration form) then sent out the promo via social media. Next day – 150 clicks, 0 signups. Yikes. For a promo like this, I’d expect 30-50 signups out of that 150 so that made me very concerned. I went through to test it – and immediately found the problem. On the registration form I was sending them to, it was set for ONLY the UK. If you tried to register, the only countries you could register from were UK and Ireland. That was set up by default by Unibet and I had to change it. Changed it and a day later? The signups started coming on. I could kick myself for missing that – but hey it could be worse at least I caught it now as opposed to months down the road. That’s what a program like StatsRemote is great for, and one of the biggest uses I get out of it. If I see a program with say 100 clicks and 0 signups, I’m immediately looking into that one further to make sure the link still works, and then it allows me to optimize for that program better. Something to think about. As you’re sitting there treating your hangover from the Super Bowl – start going through those affiliate links, and make sure there are no issues. Intertops: Happy Birthday! 20% to $100 bonus at Sportsbook, 100% to $100 at casino, and 2 free gold chips at poker room. Bet-At-Home: Happy Birthday! We wish you luck! Speaking of luck, you should come play roulette at our casino! Ruby Palace: Have a 200% Match Bonus! Slotastic: Happy Birthday, have $25 free! The Palace Group: Log in to Piggs now and unwrap your special birthday present! It’s fascinating to see how different they all are, and it kills me to see how outright BAD some are. I’ve made money many a time from a player who hasn’t played in 6 months, then next thing I know they’re at the casino tables, poker tables or bingo games and bringing me in money. Many times I’ve asked what retention method the program used, and I’d say at least 30% of the time the answer was “it was their birthday”. I’m undecided what I like better. No deposit bonuses are great, but I dig that one from The Palace Group. Log in to unwrap your special birthday present? Who can resist that? Then present them with 5-10 free spins or something. Get them playing and there’s a very good chance they’ll keep playing. Or just wish them luck then to an awkward segway into playing roulette at your casino. Some real marketing geniuses at work there. They’ll be head hunted by Facebook and Google in no time. Now I’m off to have me some breakfast, watch some EPL followed by NHL then the Super Bowl. I have a bet with my buddy – if the Broncos win, I pay the bar bill. If the Seahawks win, he pays the bar bill. If the Broncos win, I may just need a $710,923, 613,350 prop bet to come in to pay for it! This article was written on February 2, 2014 however all articles are looked at on a monthly basis and updated to keep them relevant.